I've bought a few Abercrombie novels over the past few years, partly due to the huge amount of positive feedback his work attracts but also as he is a fellow Lancastrian, hailing from the same fine city as I. 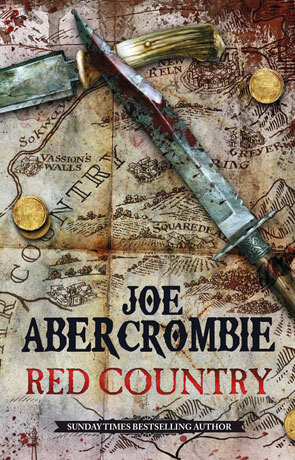 Due to the sheer volume of review copies I receive I've yet to have time to actually read any of his work and so getting Red Country from those lovely people at Gollancz was a god-send. I can finally read the work of an author who attended the same school as my two younger brothers (around the same time too). So on to Red Country itself which takes a low fantasy setting and adds to this a slight flavour of the wild west, all wrapped in a gritty, unrelenting realism and a trace of heroic fantasy. Apart from the fact that the book is set in a fictional world Red Country doesn't contain much in the way of fantasy elements. There are no races mentioned other than man (except for one brief, ambiguous passage), no real magic cast (although there is a brief encounter with a "Mage") but the context does suggest heroic fantasy - just without the traditionally styled heroes. The book concerns Shy and her step-father Lamb as they forge a path through the country looking for Shy's younger brother and sister who have been kidnapped from the family farm. This realism works very well with Abercrombie's style of writing, a no-nonsense approach that creates a wonderful sense of immersion. This is humanity on show, no one's perfect; in fact on the surface no one is even that good and yet each are capable of heroic feats and acts of kindness. The real beauty lies in how each of these characters are brought to life in a disarming, utterly engaging way. I also loved how the author didn't end the tale where most would have done, the actual ending is highly rewarding and perfectly fitting. The whole novel is simply a joy to read, full of little unexpected twists and turns and providing a wonderfully rich examination of the sometimes harsh realities of the human condition. Clever dialogue combines with a dark, witty narrative, a wonderfully rich tone and entertaining characters to create something that is pretty much irresistible. One of my favourite reads of recent times. Written on 14th November 2012 by Ant.